Recently, I had the privilege to sit down and talk to Linda Schaefer. Linda is an artist, author, videographer, and photographer who has traveled the world garnering much respect in the media industry. She has worked for CNN and Associated Press and her work has been published in The Catholic Digest, GQ, New York Times, LA Times, Time Magazine, Newsweek and many more. I have to admit, I was very nervous about the opportunity to interview her. I haven’t interviewed many people in the past and other than a new radio show that I co-host, I don’t have much experience. I quickly realized as I started talking to Linda that she would make my job very easy. Linda is an incredibly sweet woman and very approachable which consequently turned the interview into more of a friendly conversation, in which, I was much more comfortable. Linda has and incredible story and when I (providentially) picked up a phone call from her, I knew I had to take this opportunity to capture her story and share it with the St. Michael Catholic Radio listeners. Linda began her career as a journalist for CNN in 1985, but always kept her first love close — still photography. In June of 1995, Linda had her first contact with Mother Teresa, who was visiting Atlanta. Traveling to Calcutta several months after meeting Mother Teresa, Linda had the rare opportunity to document the work of the Missionaries of Charity. 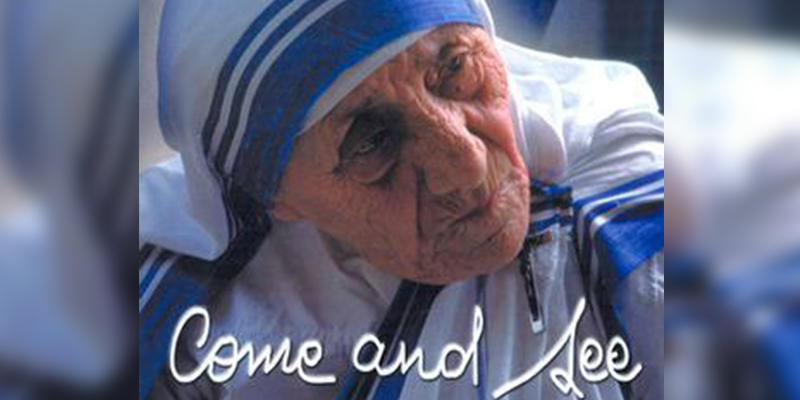 Prophetess of Our Time begins with Linda’s journey to Rome for the beatification of Mother Teresa in 2003. It closes with another trip to Rome in 2012 for Christmas Eve Mass with the Pope Benedict XVI followed by his surprising resignation. Enfolded in the 166 pages, Schaefer includes conversations with two renowned priests who worked alongside Mother Teresa for several decades. She also includes an interview with one of Mother Teresa’s first sisters to join the order she founded in 1950, the Missionaries of Charity. Schaefer invites you to follow her through this second journey that includes text and photographs. Blessed Teresa of Kolkata invited Schaefer to “Come and See”. That has been Schaefer’s mission since 1995 when she first met Mother Teresa in Atlanta, Ga.
Linda will be coming to Tulsa, OK July 23rd at The Catholic Book and Gift Store from 1pm-4pm with a special presentation at 2pm. Everyone is invited to come meet Linda, get a signed book, take pictures, and visit. You can visit Linda’s website here for more information on Linda. Adam is the Vice President of an award-winning local Catholic radio station and the host of The Catholic Man Show. Adam and his best friend/co-host, David Niles, had 0 experience in the radio business before being presented with the opportunity to start a Catholic station in 2014. Taking a leap of faith, they launched St. Michael Catholic Radio and it has now grown into covering the whole Tulsa Market, airing multiple local programs, and carrying EWTN content. Adam is married to his beautiful bride Haylee and they have 2 young boys Luke and Jude. They live in Tulsa, OK where they are active in many Catholic bible studies, church functions, apologetic groups, and Cursillo. You can follow Adam on twitter or like St. Michael Catholic Radio on Facebook!